The pool area, a place for socialising and relaxing. Covered, heated pool, open from 1st April to 30th September. 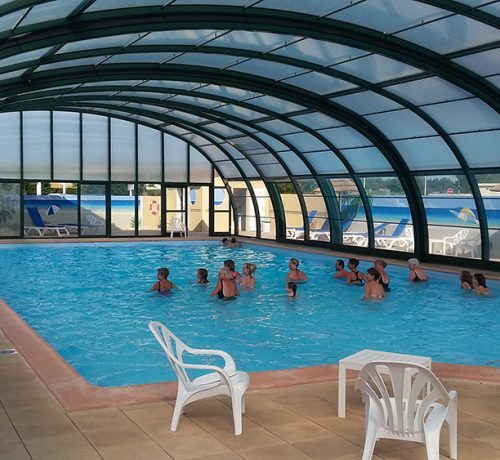 Our large, 200m² pool is suitable for adults and children, families, couples and friends. You can recline in your deckchair, on the 200m² deck, and supervise the youngsters while they paddle safely. In low season, the pool area, which includes both the pool and deck, is fully covered so you can enjoy a pleasant time relaxing in the spring sunshine. 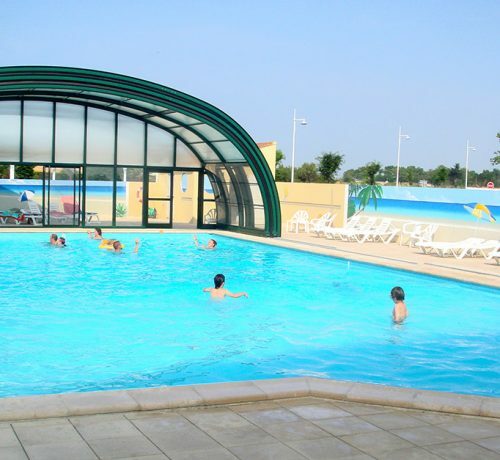 In high season, the structure is left open and the pool warmed by the sun – something the south Vendée region is well known for! The campsite pool is open from 10am to 8pm in high season and 10 am to 7pm in low season; there is no lifeguard supervision. Only swimsuits and swimming trunks are permitted.